When we think of dangerous things for a baby our minds are often carried to a few stand-out things: Small toys they can choke on, BPA bottles or other toxic chemicals, and the list goes on, right? 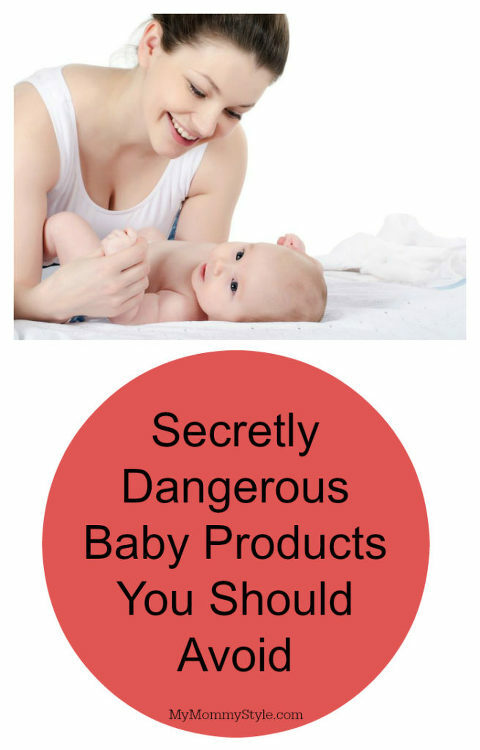 But, interestingly enough, many baby products that are very commonly used can also be just as dangerous, if not more! Here is a list of 10 frequently used baby products that, though most are approved through all government safety standards, are still unsafe. But fear not! There’s also a list of products to use instead, making sure your baby is as safe as he/she can be. You know that crib tents are meant to keep your toddler from climbing out of their cribs, sure. But did you know that these are actually fairly more dangerous than they are helpful? Commonly they are made of mesh, and after your little one poking and prodding at it enough, holes can form and your little one can ultimately get trapped and tangled within it. A toddler bed. If your little one has a habit of wanting to climb out, perhaps it’s time to switch to a toddler bed. This bed looks like a regular bed rather than a crib, is generally lower to the ground and comes with a toddler-size mattress. At first you may find your little one wondering out of it more, but soon enough they will learn to use it properly (fingers crossed!). Either way, it’s a safer option than the aforementioned crib tents. Crib bumpers are used to keep little limbs from getting stuck between the crib rails. In reality, what these crib bumper pad do is pose the risk of suffocation and or strangulation. You do not want to risk your baby’s head getting caught on the side of the crib and the bumper and running this risk. Additionally, bumper pads can act as a mode for older kids to climb on and crawl out of beds. The best thing to try and use instead would be a mesh liner. This option still prevents your child from getting their little limbs caught, while also offering total ventilation and breathability. Okay sure, this one may seem bizarre because when you think of soft bedding, you think of comfort, right? You should avoid soft bedding because it runs the risk of suffocation. Some of this soft bedding product includes: plush blankets, silk pillows, and most other cutesy or decorative nursery pieces. Just avoid it. Sleep sacks, swaddlers or footed pajamas are all great alternatives that will keep your baby cozy and warm without running the risk of suffocating them. Sleep positioners are supposed to be used to keep your baby sleeping on their back by wedging them between these flat mats. Ultimately, these pads risk suffocation. Nothing. Once your baby has the neck strength, they will control their roll over. This one may seem a little obvious, but perhaps not. While a pretty popular option yet, the drop-side design crib is not ideal when it comes to safety. The drop-side rail on the crib runs the risk of coming loose due to any number of issues such as faulty hardware, resulting in the railing to come detached where your baby can get trapped between the rail and the mattress or simply fall out. It’s best to avoid this design all-together. This one is easy. Simply get a crib with fixed sides instead. This invention seems ideal with allowing your little one to sit upright in the bath tub, but the ultimate risk here is that the seat can easily tip over. There are suction cups fixated on the bottom of the seat that are meant to secure it, but that doesn’t always mean that they will. Your child runs the risk of tipping over and drowning, even if the bath is an inch of water. Take ultimate caution. And while you should never turn your attention away from your child or leave the bathroom while they are in the bath, it’s best to keep as safe as possible even when you are being very attentive. Until your little one is of age to sit in the bath unassisted, you should use a baby bathtub. They are generally much more stable, lower to the bottom of the tub and contain your baby in a way that is far less likely to tip or slide. These floor seats come with the cool and comfy look, but are they totally safe? If your baby leans, arches or rocks themselves too much, they run the risk of falling out while lounging or feeding. These seats are also not meant to be placed on tables, counters or other high and uneven surfaces. If you’re going to use one, keep it to the floor. But, don’t risk the injury. Baby swings or activity centers are a better option for lounging, play and feeding seeing as they keep your baby contained, making them a safer alternative. Walkers are mounted on wheels, and we all know wheels roll. Every year, countless injuries occur because of these devices. They may seem convenient to help your little one learn to stand and walk, but they have also been said to stunt the progress your child develops on their own. They have the right idea, but there are better alternatives. A stationed activity center is a great alternative. You baby is still allowed to stand, bounce and move around but safely on a secured base. This might seem goofy, because keeping your little one occupied while in the car is a total “yes, please!” Especially on long rides, right? However, if it did not come with the car seat, it’s probably a bad idea. In the end, the danger here is the risk that these attachments will hit your child in the face. Neither mom nor baby wants that, right? Give your child a teether toy to play with while in the car. Not all teethers are dangerous! However, there are a few things to look out for. Specifically, here, we are talking about mold growth. There have been recent instances where mold growth has been noted, specifically within popular teethers such as the Sophie the Giraffe teethers. But this is a valid concern for any teether toy with any sort of opening where moisture can seep in and grow. There’s no doubt that some of these characters are super cute! But you know what’s not? Yes. Mold. It’s best to avoid this risk all-together. A great alternative for your teething babe is any natural teether like a maple wood ring, natural rubber teether with no openings and the like. Either way, teethers should be replaced relatively often and definitely cleaned often. Make sure to follow the special care instructions from the manufacturers. And there you have it! Whether you are a new mom-to-be or you have a few little ones at your feet right now, these are simple guidelines for you to follow to ensure your sweethearts are safe and healthy as can be. And better yet, all at your control!